The Fleischer Superman cartoons are so pivotal to my love of pop-culture cool, I carry them around on a smartphone app, whipping one out for a watch and a reminder of said coolness, whenever the opportunity (or battery life) represents itself. Now Warner Bros, having restricted the cool for so long to the likes of DVD and Netflix, have recently stuck these classics on their own YouTube channel, for free! Talk about Thanksgiving! That second vocal intro is a key part of the appeal for me too. How well does that nail what Superman should be? I'm thinking the episodes will rotate, explaining a few absences, so do yourself a favour; bookmark the Warner Bros YouTube page now. If you end up referencing these gems as often as I do, any other form of access will seem like the finding a modern day telephone box to change into. 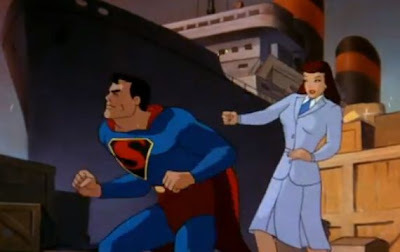 I'll always have a soft spot for the Fleischer Superman cartoons as well Dan. They were the only studio at the time to give Disney serious competition back in the day, because of those beautifully painted cells. That version of Superman, and costume, will always be my favorite version of Superman ever. NU52 be damned! Amazing! Got to upload this to my iphone. Cool to watch. The animation is much more fluid than recent superhero cartoons. It has a real frenetic style to it. I think I remember reading somewhere that people back then watched the animation first and then that turned them on to the comic. I wouldnt be surprised Karl. Like you and Aliera say, the pacing really sells you on the characters and even for old comic fans, makes you want more! Thanks Dylann and welcome to IADW! Entire series on 'smartphones' and online audiences of billions. You have to wonder if the creators of these episodes wouldve thought those facts more far fetched than a man as powerful as a speeding locomotive. Dale I have to say I kinda like it for the non flying Superman too. It's very Doc Savage to see him get round in more puld hero ways. Have they been restored as well? They look great, at least the still shots do. I think so Craig - but even my DVD copies look pretty well treated. Perhaps good art truly never fades, so in 70 years look for Batman The Animated Series to be getting the same treatment! I can't believe how much that animation has aged in 20 years. I catch it on the Hub here in the US and the stories are timeless. The animation not so much. Colors have faded a bit. I'd love to see if they did anything for the blu-ray editions (if they're out yet).